The Government of the Republic of Tuva decided to support financially the maintenance work of the airplanes park of the republic which has not been renewed for a long time. Two airplanes "Yak-40" will be repaired in the Minsk aviation plant (Byelorussia) and two airplanes "An-2" will undergo a small reconstruction in Omsk (Siberia) in order to adapt them for another type of the fuel. Moscow philarmonics has opened its new concert season with the solo programme by famous Tuvan opera-singer Nadezhda Krasnaya. She presented to the public her own interpretation of romances by Edward Grig's "Roses" and "Swan" and Sergei Rakhmaninov's "Do not sing in my presence, Beauty" and "Spring waters". Right after the concert was over Nadezhda Krasnaya had to go to the airport to take a plane to Kyzyl. Her mother has got very seriously ill.
2001 is a remarkable year in the biography of famous ethnographer Sevian Vainstein, who has devoted the better part of his life to Tuva. In April this year by the Decree of President Putin he was awarded with the title of the "Merited Scientist of the Russian Federation". Sevian Vainstein is now finishing the work at the book "Tuva, full of secrets and mysteries: 50 years of expeditions and work", which is going to be released by the Publishing House "Anloutte Verlag" (Jurgen Boden) in Germany. Afterwards it will be translated into English and French. International Centre on Biosphere research in the Ubs-Nuur Hollow is Turning Today 10! International Centre on Biosphere research in the Ubs-Nuur Hollow is celebrating today its 10th anniversary. The scientific conference devoted to it is taking place both in Tuva (Kyzyl) and in Mongolia (Kovd). The Ubs-Nuur center, founded by Professor Victor Bugrovski, has paved way to a principally new school in ecology "Functional Ecology" which makes it possible to observe the changes in ecosystems in its dynamics. The Ubs-Nuur Hollow is an ideal place for such observations. It's a kind of the Earth model combining on the relatively small territory practically all natural zones: from a tundra to a desert. 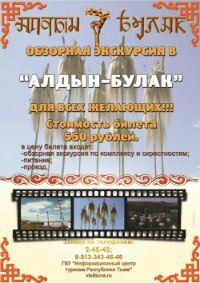 Today the International Fair is opened in the village of Khandagaity (Oviur district of Tuva). The Mongolian and Tuvan goods are exhibited and sold there. Among participants of the Fair are more than 200 enterprises and individuals from Tuva, Ubs, Kovd and Bayan-Ulgi aimaks of Mongolia. The Tuvan President's condolescence is published today in the republic. It reads:"On behalf of the people of the Republic of Tuva I express deep concern for the further development of the situation in the world and sincere condolescence to the families of all those perished in New-York. We are with Americans. We condemn all kinds of terror, no matter where it takes place. I support the idea of President Putin to work out international law regulations for the struggle against terrorism. Only uniting our efforts in the fight against terrorism we can expect effective results". Out of all the exhibition of different Publishing Houses of Russia, put on displau at the XIV International Moscow Book Fair, the exposition of the House of Peoples of Russia was in much greater demand. Hosts of this exposition Chimit-Dorzhu Ondar and Sergei Kuchinski had to answer numerous questions concerning books and magazines about the life of different nationalities of Russia. As they have said afterwards, this experience has proved once again the necessity to open up a special bookstore with the literature on People of Russia on sale. Such a store will begin functoning in October this year in the main Pavillion at VDNH (all-Russian Exhibition Centre) in Moscow. The situation on the Tuvan stretch of the Russian-Mongolian border has got tenser due to the recent accident with the gun-fires. Two Mongolian frontier-guards have surpassed the state border and gone deep into the territory of the neighbouring republic to meet Tuvan hay-harvesters there. Their accidental meeting ended in gun-firing. One of the Mongolian frontier guards got wounded and died on the way to the hospital. The other one was arrested. The investigation of the case has started. Today Sherig-ool Oorzhak, the President of the Republic has signed the new election laws adopted by the Supreme Khural (parliament of Tuva) in July this year. The new laws would serve as the base for the introduction of a new state system in Tuva. In accordance with the new Constitution of Tuva, adopted on the republican referendum on 6, May, 2001 Tuva will have no President any more but will have a 2-cameral parliament consisting of 162 deputies. These innovations were initiated by the Sherig-ool Oorzhak and were supported by people through an all-republican vote in May.